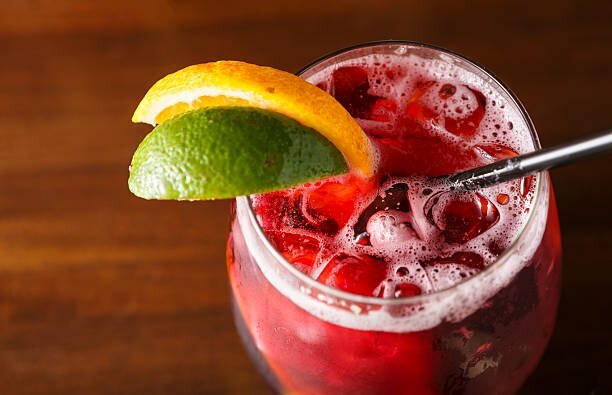 When you think Summer patios you think Sangria. The fruit chunks, combinations of aromas and flavors, the sweet but not overly sweet taste, the tartness of wine and citrus. The fact that you can get your vitamin requirements while drinking alcohol. What’s not to love? Only one thing could make this lovely drink even better, kombucha. Conveniently, kombucha already has the fizzy, tangy flavor that a good Sangria requires. Any pre-made, fruit based kombucha will do the trick. But why stop there? it’s a drink where you can use any seasonal, fresh and abundant local fruit to create your own twist. The more variety the better and you can create your own piece of artwork in a pitcher! In this recipe we will show you how to make a pitcher of a classic cocktail with a modern twist using kombucha. The Kombucha Sangria. Be the talk of your next party and serve something different. Combine the bottle of red wine, kombucha, orange juice and fruit in to the pitcher. Squeeze the lime wedges in to the pitcher and toss them in as well. Stir well with the spoon. Let the mixture sit over night in your fridge to allow for the juices to mix and the fruit to absorb the flavor. If you are serving it the same day, a few hours will work as well. Taste and add more kombucha if you desire more carbonation. Fill pitcher with ice and serve. The fruits in this recipes are just a suggestion, feel free to use any combination of apples, berries, peaches you can find. Mango, kiwi, strawberry, pomegranate and tropical fruits all work great and taste amazing. The kombucha you use will also dictate the flavor of your sangria. If your kombucha does not contain a lot of sugar and you want to sweeten the sangria, use more juice (orange, pineapple juice both work).